In addition to being a very well-made, well designed tool, this kit does not force you to buy unwanted bits and accessories. Most of us have driver and drill bits and just need a new driver! Once again Milwaukee pays attention. On the better end of the tool spectrum there has been a blurring of the line between home shop and professional job site target markets. That means woodworkers and other home shop buyers are getting better tools at better prices. Folks like Milwaukee Tool is one of the leaders in building tools for that blended market and the Milwaukee M12™ 3/8” Drill/Driver is just their latest offering in that effort. The Milwaukee M12™ 3/8” Drill/Driver (#2407-22) is a mid-sized drill/driver that packs the punch that full-sized models did not so many years ago. It delivers up to 275 in lbs of torque yet is just 7-3/8"-long and weighs a trim 2-1/2- lbs. Milwaukee says that the Milwaukee M12™ 3/8” Drill/Driver develops up to 25% more torque than the competition and I can find nothing to refute that. That low weight is made even easier to handle by an ergonomically designed grip area that uses a rubber overmold to enhance grip and reduce vibrations. The Milwaukee M12™ 3/8” Drill/Driver features an on-board battery fuel gauge that uses a line of LED lights to depict the remaining run time. Located above the trigger is an LED light that comes on when the drill is started then stays on for several seconds while you locate and engage the next fastener. The Milwaukee M12™ 3/8” Drill/Driver has a two-speed slider-style selector on top that lets you choose between the low range (0-400-RPM) or the high range (0-1,500 RPM). The trigger is a true variable speed switch that lets you match the final RPM to the job more precisely. A side-to-side selector just above the trigger controls forward and reverse operations. Leave the slider in the center and it locks the trigger out altogether. (You can still turn the LED headlight on with the slider in the center) Play y9 games online for children. The keyless chuck (left) has a 3/8"-capacity and is simple to work yet holds tough. the clutch ring (right) just behind the chuck is accurate, slips properly and repeats well. A 19-position clutch ring lets you choose from 18 levels of torque application or in the final position, locking the clutch out for drilling operations. Just ahead of the clutch is the all-metal, ratcheting keyless chuck with a 3/8”-capacity. 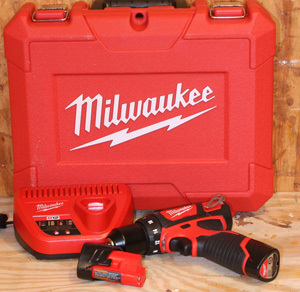 The kit shown in this review (#2407-22) includes the drill/driver itself, two Lithium Ion battery packs, a fast charger and a molded plastic carry case that protects your investment while keeping everything where you can find it! 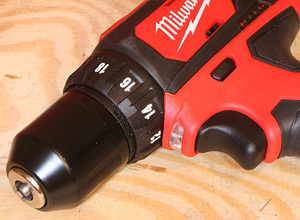 The Milwaukee M12™ 3/8” Drill/Driver uses Milwaukee’s M12™ REDLITHIUM™ battery technology. Two of these compact packs come with the kit along with an 110V charger that refreshes the packs in about 30 minutes. 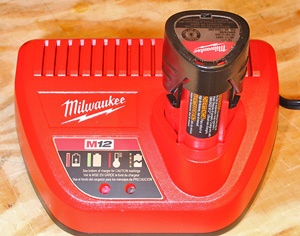 The Milwaukee M12™ 3/8” Drill/Driver and the charger accept the stalk type batteries that eliminate cross contacting that can damage the components. That stalk connector also makes swapping out a discharged pack for a fresh one quick and tool free. The M12™ REDLITHIUM™ batteries are said to bring longer-running charges to the job site and all of the testing I have done seems to support that claim. These batteries really do seem to run a very long time in a normal shop environment. They also maintain consistent power right up to where they need charging so there is no slow down as the charge is depleted. 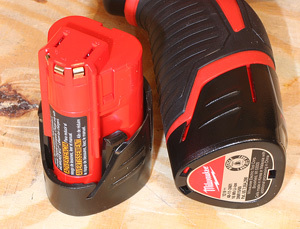 The battery packs (left) are small in size but large in power. the keyed stalk-type connector prevents costly accidents. The included charger works fast and uses simple lights to keep you apprised of the progress. The Milwaukee M12™ 3/8” Drill/Driver is typical of Milwaukee tools in its tough, user-friendly design. Though not heavy by any measure, the Milwaukee M12™ 3/8” Drill/Driver does feel substantial to the hand due to its industrial-like construction. The power available is very good and surpasses all of the needs I could come up with in the shop. The clutch lets you drive small fragile fasteners without fear of twisting them off or you can drive the big screws with power to spare. Returning to a specific clutch setting seems to accurately return you to the torque level it developed last time. Not all clutches are built that accurately. One unexpected capability is the drilling speed. I have other drivers in this class and the Milwaukee M12™ 3/8” Drill/Driver seems to maintain a higher drilling speed than the others. That is not a big deal when working with wood but if you sometimes encounter a piece of metal needing a hole, the Milwaukee M12™ 3/8” Drill/Driver could make that task a bunch easier. The keyless chuck is flat easy to use. Locking a bit in place is easy and the chuck holds fast even during tougher drilling jobs. I never felt that I had to strain to tighten the chuck on a bit to prevent spinning. One of the hallmarks of a quality chuck is that it just works well all of the time, no flash, bells or whistles; it just works right all of the time. The Milwaukee M12™ 3/8” Drill/Driver has that chuck. If you want a buy-it-once drill/driver for your shop the Milwaukee M12™ 3/8” Drill/Driver should be on your must-see list. This is a well-made tool that has the features we need without the fluff. The kit reviewed here is “bare-bones” but for most of us that is how we want it. 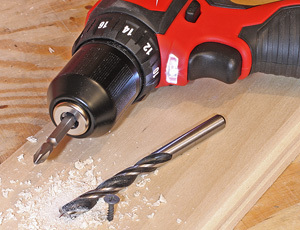 Most of us already have a bunch of drill and driver bits so the Milwaukee M12™ 3/8” Drill/Driver does not include extra parts that increase the price. With a street price of just $129.99 (9-18-2013) the Milwaukee M12™ 3/8” Drill/Driver is a great value as well as a solid tool. Milwaukee Tool has had a reputation for building long-lasting tools and equipment and the Milwaukee M12™ 3/8” Drill/Driver certainly appears to carry on that tradition.